VinylMaster Pro V4.0 (Professional). Professional Vinyl Sign Design & Cut Software. The software comes on 2 DVDs in a 14mm DVD case with a Quick Start Guide - Pictures are for illustrative purposes only. Brand New - Professional Vinyl Cutting Software! VinylMaster Pro is dedicated software for: Designing Super-High Quality Vector-Based Artwork Providing You with a Powerful Suite of Design Tools Easily Laying out Your Artwork/Designs/Creations/Logos Professionally Cutting your Artwork from a Vinyl or Die Cutter inc.
Laser/ARMS Cutters, Engraver or Router Publishing your Artwork to a Super-High Resolution PDF file. VinylMaster Levels - Please choose a Level that matches "your" needs! Professional (Top Mid Level - This Item). What's the difference between levels? Visit the product site to compate each level. Please allow up to 24 hours (usually much less) for your unlock code to be generated by Future Corporation in Australia (excluding weekends and public holidays). 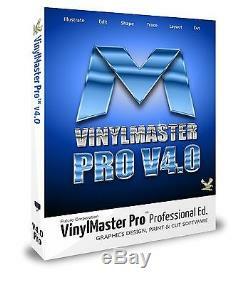 VinylMaster Pro can also be downloaded from here. Note: You must have a PSN to download the software, see Ordering above. Nothing at all, the downloads are exactly the same as the discs but allow you to install, activate and use VinylMaster without delay and there are no download limits or restrictions and these are up 24/7/365. Think of the discs as a backup in case all else fails! But definitely not necessary to use the software. And in many cases from your postal service's website. This sale is for a perpetual software license provided on discs (2 x DVDs) and via download (online 24/7/365) i. Note: the license can easily be moved from one computer to another (for more information please see the FAQs below). If you are in any doubt about whether or not your device is supported, please send a message. Please see the FAQ (below) or please send a message and also see the VinylMaster Showcase. Free Trial, Brochure & Video. VinylMaster Xpt - Introduction Video. (several of VinylMaster Pro's tools/features are shown). Note: You can adjust the. Find over 200 (and growing) VinylMaster How To's, Lessons & Tutorials at YouTube. VinylMaster Pro - Screen Shots. 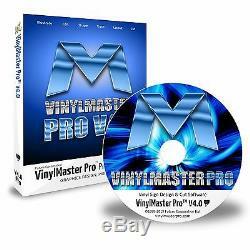 Easily Create Distortions upon Distortions using VinylMaster Pro. You don't need Illustrator or Corel Draw to create eye-popping artwork in fact these programs don't have the Vinyl Sign Design + Cutting Capabilities of VinylMaster Pro! If you want even more Designing Power and Output Options please visit my store and look up: VinylMaster Xpt. Easily Create 3D Effects directly with VinylMaster Pro. Packed with a huge suite of Text Tools. Easily Create Simple Distortions and Vector Effects in VinylMaster Pro. Easily Create Power Shapes (with on-board controllers) using VinylMaster Pro. Easily Create all sorts of Block Shadows using VinylMaster Pro. Easily Create all sorts of Drop Shadows using VinylMaster Pro. Easily Measure & Layout your Artwork & Designs in VinylMaster Pro. 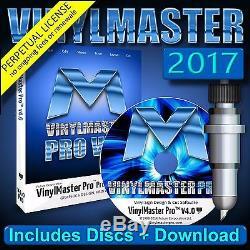 VinylMaster Pro - Tools & Features. Create Special Image (Bitmap) Effects using VinylMaster Pro. Create Flag Effects using VinylMaster Pro. Create Text Based Block Shadows (Cuttable Vectors) using VinylMaster Pro. Create Text Based Drop Shadows (Cuttable Vectors) using VinylMaster Pro. Loads of Distortion Effects are included with VinylMaster Pro. Outline Effects using VinylMaster Pro. Inline Effects using VinylMaster Pro. Outline Styles available in VinylMaster Pro. Stripe Effects using VinylMaster Pro. Engraving paths using VinylMaster Pro. Easily convert Images (Bitmaps) into Cuttable Vectors using the Vectorizer. Manage, View, Install and Use Fonts (on-the-fly) directly with Font Manager. Contour Cut Images and Vectors Together in the Contour Cut Module. Setup your Contour Cutting Jobs for your Laser or ARMS Cutter with the Contour Cutting Wizard. Easily Manage and Setup your Cutfiles using VinylMaster Pro's Powerful Cut Documents. Manage your Cutfiles and Improve Your Productivity with the Vinyl Spooler. Access and Use Important Tools from the Powerful DesignCenter in VinylMaster Pro. VinylMaster Pro is dedicated signmaking software designed specifically for making the most amazing vinyl signage. VinylMaster Pro allows you to produce a wide range of vinyl lettering, logos, signage, pinstriping and comes with a suite of powerful text, curve and object tools. There is simply no other dedicated vinyl sign software on the market today which has the truly amazing features, built in training and ease of use of VinylMaster Pro. VinylMaster Pro - Summary of Tools & Features. Vector Effects 3D Modeling (on-screen) Outline, Inline, Drop & Block Shadows Multi-Outline and Multi-Inline Effects Distortions inc.
Arc, 2D, Flag, Globe, Squeeze, Cylinder, Waves and Envelope Drawing Powerful and Intuitive Drawing with highly-advanced Curves and Specialist Tools Stroke, Color & Pen Styles (Suite of Dotted/Dashed lines with Start & End Caps) Shaping and Welding Tools inc. Punch Out, Stamp, Trim, Common and Keep CMYK, HSV, Lab, RGB Color mgmt, Spot Colors, Texture/Reverse Fills Gradients - Linear, Radial, Square & Conical now with 800+ Preset Gradient Fills Engraving Module for creating Tool Paths inc.
Island Fill, Line Fill and S-Sweep Layout Master Pages, Work Sheets, all major Page, Photographic & Banner Sizes (ISO/US) DesignCenter inc. Object Manager, Object Selector, Property Inspector Grid, Guides, Dimensions, Align, Space, Distribute Step & Repeat, Tile and Circle Arrays Bitmap/Images Highly Accurate and Super-Fast Tracing with the Vectorizer Color Adjustments, Blur, Crop, Filters, Resample etc. Anti Alias, Emboss, Fish Eye, Mosaic, Posterize, Solarize, Spot Light, Twist etc. Fonts Font Manager to view all fonts and install on-the-fly Work with TrueType, Type 1 and Type 3 Fonts Text Huge Suite of Text & Fonts Tools Artistic, Paragraph, Arc, On Path, Vertical and Int'l Text Tools Import/Export & Publish To Excellent Import & Export inc. Import & work with very large bitmaps/images without problems Publish to PDF for Proofs or Super High-Res Artwork Vinyl Cutting New Send-To-Cutter Module for Instant Cutting Powerful Cut Documents with Color Separation/Advanced Editing inc. Nesting Speed-Weed and new Easy Lift-Marks Streamlined and Powerful Vinyl Spooler Contour Cutting All new Contour Cutting Wizard with Auto-Build Contours All new Cutfile Alignment Module for Pin-Point Accuracy Supports Laser Pointer and ARMS Cutters Support & Setup Support is provided Free of Charge 400+ Page Manual, 110+ Video Lessons & Tutorials at YouTube. With Free Updates, Knowledgebase, FAQ. VinylMaster Pro comes packed with all these Extras. 9,609 Clipart Stock Clipart Libraries sorted by Category 10,500 FutureFonts Collection High quality true type fonts - all sorted into correct typographic categories 40,000 Corporate Logos Comprehensive set of the world's leading brands and companies. Please note that Corporate Logos are not available in all jurisdictions. 1,059 Signs & Road Signs Comprehensive set of standard Signs and Road Signs inc.
Safety and Highway Signs 1,164 Textures High quality Textures 800 Gradient Fills Fantastic set of Gradient Fills all sorted by Category 10,000 Vinyl Color Pallets Huge range of Vinyl & Named Color Charts. Over 800 Gradient Fills are included with VinylMaster Pro. Over 1160 Textures are included with VinylMaster Pro. What can I do with VinylMaster Pro? VinylMaster Pro is ideal for A Boards, Awnings, Banners, Billboards, Car & Truck Signage, Decals, Directory, Road, Safety & Traffic Signs, Honor Boards, Light Boxes, Metal (Engraved, Laser & Plasma Cut) Signs, Monumental Masonry, Plaques, POS, Real Estate, Shop Windows, Super Sites, Tickets, Trophies, Vans, Vinyl Lettering and all kinds of Graphics Design & Artwork! 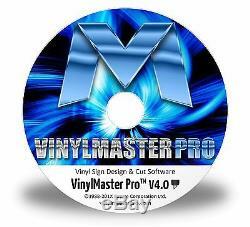 VinylMaster Pro is vinyl cutter software and vinyl plotter software for sign makers, signmaking, signwriters, sign writers, signmakers, and screen printers, for making and designing vinyl based signs and signage using a vinyl cutter and vinyl plotter and vinyl cutters and vinyl cutting plotters for cutting onto vinyl and media for use with craft, scrap booking, pin striping, lettering, t shirts, general signs and signage and all related sign and graphics business. Vinyl cut software plot and design. Contour cut and contour cutting software. What's the difference between each version of VinylMaster? There are a lot of significant differences between each version, as follows. VinylMaster Series V4.0 - Short Feature List & Comparison Guide. VinylMaster Xpt offers a total solution for all your signmaking needs. Packed with tools and features to design and output everything from vinyl signs, decals and stickers right through to banners, full color posters and super-sites. Includes advanced Contour Cutting and a full-featured RIP with direct drivers and ICC support. VinylMaster Pro allows you to produce a wide range of vinyl lettering, logos, signage, lettering, pinstriping and comes with a suite of powerful text, curve and object tools. VinylMaster Ltr is dedicated sign software designed specifically for making vinyl lettering. VinylMaster Ltr allows you to produce a wide range of vinyl lettering, logos, signage, lettering, pinstriping and comes with a suite of powerful artistic text, curve and object tools. VinylMaster Cut is for simple vinyl cutting and allows you to produce vinyl lettering, logos and pinstriping. VinylMaster Cut comes with a suite of text, curve and object tools and fully supports ARMS/Laser cutters. Summary of Tools and Features. Smooth Screen Display, Zero-wait State (fast-draw), Multi-Page Documents. Object Manager, Object Selector, Property Inspector. Master Pages, Work Sheets, all major Page & Banner Sizes (ISO & US). Workspace Profiles - work in a simplified environment or expert mode. Contour Cutting - supports ARMS and Laser Pointer cutters. Vectorizing (Black and White and full Color Tracing). Mask Editor (Masks, Background-removal, Transparencies, Vignettes). 3D Modeling and Shading with 150+ Cool Presets. Soft Shadows, Glow, Fire, Reflections, Bevel, Bump Maps etc. Outline, Inline, Stripes, Block & Drop Shadow and 3D Vector Effects. Arc, 3D, Flag, Globe, Perspective and Envelope. Step & Repeat, Tiling, Circle, Arc & Spiral Arrays. Layout Tools (Guides, Dimensions, Align, Space & Distribute). Text Tools - Full Suite of Desktop Publishing Tools & Features. Image (Bitmap) Editing & Effects (Color Tools, Filters, Duotone). Power Clips, Shaping and Welding. Import and Export in CMYK or RGB with ai, eps, jpg, pdf, png, tif, ps etc. CMYK, HSV, Lab, RGB Color mgmt, Spot Colors, Texture/Image/Reverse Fills. Gradients - Linear, Radial, Square & Conical. Powerful and Intuitive Drawing with highly-advanced Curves and Tools. Stroke, Color & Pen Style (Dots, Dashed and End Caps). Font Detective (Advanced Font Matching & Management). TrueType and Type 1 Font Support, Single Stroke Engraving Fonts. Auto-serialize (create consecutive number sets). RIP, Print & Cut - PostScript®/PDF RIP, ICC Support and Direct Drivers. RIP and Print Multiple Print Jobs & Optimize (overnight printing). Ultrafine Adaptive Diffusion (UAD), Color Correction, Underbase/Finisher. Cutfile Docs, Speed-Weed , Easy Lift-Marks, Spooler 5000+ Direct Drivers. Vinyl Color Separation, Nesting and Cutfile optimization and management. Engraving module (S-Sweep, Island & Line Fills). Security-1 (Security and Password access). 1500 Road Signs, 10000 Vinyl Colors, 13900 Fonts, 17000 Clipart, 82000 Logos. 400+ Page Manual, 100+ Video Lessons & Tutorials, Advanced Setup Wizard. Help Desk, Auto-Updates, Knowledgebase and FAQ. Legend: a small grey: ü means some tools are included. A large green: ü means all tools are included The small grey: means a basic version of the feature is included. Guide only, see demo and full feature list for more information. VinylMaster has over 5,000 Direct Drivers, please scroll down to Supported Brands of Vinyl Cutters. If your cutter isn't listed please send a message to get a driver underway. Is my Large Format Printer Supported? VinylMaster Pro does not include a RIP, please see our VinylMaster Xpt. No, VinylMaster is Activated quickly and easily online - no more lost or broken Dongles! Is an Internet Connection always required? No, the only time you need an Internet connection is to Activate i. Unlock the software and this can be done remotely from any computer - any connection will do! Can I use VinylMaster on more than One (1) Computer? You can install VinylMaster onto as many computers as you like and then design your work and save it off. However, if you want to output from a particular computer then it needs to be Activated and you get one Activation per license. See our 2 for 1 License Specials and of course you can always Deactivate a computer and Activate another as many times as you like. No, this sale is for a perpetual license - it does not expire like many other programs! How much does Tech Support cost? Tech Support is provided at NO Charge! How long do I get Tech Support for? Tech Support is for the life of the product and not 30 or 60 days like many other programs! Can I Cut from the Demo! Yes, you can cut from the demo via the setup wizard after you've installed your Cutter's Driver... Once done you can then cut any of the sample cutfiles from the Vinyl Spooler. See: How to Setup a Cutter. Yes, you get 2 x DVDs with a Guide in a Case delivered to your door. Can I Return the Software? What's the difference between a Crossgrade, Upgrade and a Full License? The only difference is the price, the software you receive is exactly the same for each license. Existing customers get a larger discount for their loyalty to the product. Owners of other sign software receive compensation for their prior investment (an incentive to move to VinylMaster). A full license is for new members to the sign industry. What is an Upgrade License? What is a Full License? A Full License is a completely unrestricted license i. You are not required to meet any licensing conditions. A Full License at a discount i. The discounted price of this item. For more information please see Crossgrade Info. Supported Brands of Vinyl Cutters. ABC AccuCut ACS ADSI Advanced Plotting Devices Allen Datagraph AMD Ampak AnaGraph ANCA Animatics Anyu APD Aristo Artsign Asbru ASY Automation AXYZ Baide Baihuda Baodian Benson Best Black Cat Cougar Bluestar Bobcat Brain Power Bridge Bridgeport Mill Burny Plasma/Oxy Cutter C2000 Cadet CalComp CAMTech Centurion Challenge Chenggong Chunlei Cielle Cipher Cipher Systems Cleveland CNCTouch Cogi COLE Compact Sign Concept Copam CoSign COTEK Cougar Creation Creative CSR CT Cutting Plotter Cutty CyberCase CyberSign Dahlgren Dasheng Datafont Debece Delta Tau Desay Designtech Destiny DGI. Digital Digitex Dika Ding Ding LI DingTec Disen DK DMPL Dolphin Dragon Dwin DynaPath Eagle ELU Emblem Encad EnduraCut ESAB Eurolaser EziCut EzySign Fagor Fangyuan FANUC Fargo Fei Yang Feishida Filida FlashCut Flex-Europa FlexiCam Flycut Flying Tech Foison GCC Gerber Glider GoldCut Gongzheng Grafityp Graphtec Gravograph GRC Grenadier GRI GRS Gweike HandyCut Harris SeyBold Helitin HELO Hendiaowa Hengxing Hewlett Packard Hongda Boke Horizon Houston Instruments HT Huarai Huayu HX ICAM ICUT ICUTTER IFlow Indexer Infiniti Innovo. Ioline ISEL ITOH Jetcolor JiaChen Jiacheng Jimeili Jinan Jindex Jingong Jingwei Jinka Jinshida Jinyitai JK JSI Juli Katana Kaxing KCUT Kern Lasers King KaiTe King Rabbit Kingcut Koike KONA Kongsberg K-Ring Kroy Kuanke Kuco Kuhlmann Larken LaserComb LG-Palopoli Lichang Lida Lidar Linde Liyu Liyuan L-Tech Lynx M16 Machine Automation Master Master Tiger Matrix Max Pro Maxis MEC Mecamatic MecaNumeric Meistergram Metall MicroSystems Microtec Microtech Mimaki MORN MT MultiCam Mutoh New Century New Hermes New Star Newing Hall Norris Booth Northeast Electronics. NovaCut Novel Omega OmniSign Plus Orion P2C Pacer Palopoli Panther Pazzles Pcut Perfect Pericut Peritec Phoenix Plotter Technology Polar Powerhope Preart Precix Primera Technology PrismJet ProCut ProCut Servo Q Series Q3X Qiangyu Quality One Quest Rabbit Raven REBEL 2 Rebel Laser RedSail Refine Renown Resolve Richpeace Rite CNC RJ Robertson ROC Rockwell Roland Rotation RuiJie Ruizhou S series Saga SaliPrint Sanyi SC Schneider Secabo SEI SeikiTech Sell Senfeng Seron Shendiaowa Shenggong Shengli Shenlong Shenyin ShopBot SID Sign Sign Max Signcut Signpal. Signsay SIWEI SK SM Smitte Solectro SolventJET Songtian SP SSK Stone BR Summa Sun-up Taimes TC Techno Technoplot Teetz Tekcel TEMEI Teneth Tiangong Titan Tommotek Tuba Tuoxiang Tuwang UCUT ULI Unicut Uniform Upstar US Cutter USAsia VE Velocicut Venture Vicsign Vinyl Cutter Vinyl Enterprise Vinyl Express Vinyl Master Vinyl Pro Vision Vitor Ciola Vivagi VyTek WartHog Weihao WER Wild WinCNC Wizzard WK Xenetch XinYi Xpert Xyron XYZ Tech Yinghe Yintian Yunyang ZenCut Zeta Zeus Zhejiang Zhongcai Zund ZX. Recently added: HBC Heibao MyCut Novocut Titan 2 Titan 3 Vevor Yuda ZDCTK Plus many more makes.. Please do let us know what you plan to replace with VinylMaster or what you've used in the past. Note: You aren't required. To send back your old software or to do anything else. Terms & Conditions of Sale. Please pay promptly for same/next day dispatch. And send back your software. FEEDBACK: We pride ourselves on making sure each and every customer is satisfied after the sale is complete. We are a genuine online retailer. DIFFERENT LEVELS (VERSIONS): VinylMaster comes in varying versions for various applications - please select your version wisely - see the Comparison Table. E&OE: While all care is taken with our listings, any errors or omissions in the item details are unintentional. The item "VinylMaster Pro supports all 30° 45° 60°degree blades in sign cutting plotters" is in sale since Monday, April 29, 2013. This item is in the category "Business & Industrial\Printing & Graphic Arts\Plotters, Wide Format Printing\Cutters- Wide Format". The seller is "graphicsware" and is located in Provo, Utah. This item can be shipped worldwide.